Even with post-abortive therapy and spiritual reconciliation, the feelings of guilt, shame, and embarrassment can cause deep emotional scars for those who have chosen to terminate their pregnancy. This charm is created for those that want or desire a tangible reminder that they have been granted forgiveness from God, from their child, and especially from themselves. Therapists try to remind post-abortive women that objects do not represent or replace their child. Nothing is needed other than God's grace, but that a reminder of their child can be appropriate. 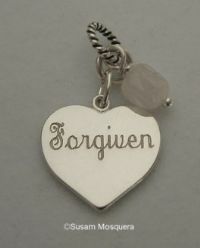 A sterling silver small heart charm (9/16" x 10/16") is engraved with "Forgiven" in script font. The back is engraved with a cross. You can choose to wear the charm with whichever side you want to face up. An optional crystal or gemstone dangle and chain can be chosen below. "I was very touched to see this charm on your website. I lost one child to abortion and two to miscarriage. I have ben rejected by many groups dealing with child loss if I admit to the abortion. 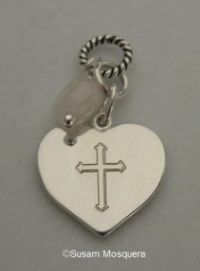 It meant alot to see your website selling a charm for women who have been where I have been. I love all three of my angels the same . Thank you."